This is a Direct Replacement OE Style Division Bar Glass Channel Run. This Direct Fit Channel is the Division Bar Run Front Door Glass Weather Strip Channel Run. This Weatherstrip Channel goes in the Front of the Front Door Window Behind the Vent Glass going down inside the door. This glass run weatherstrip will fit all Jeep Cherokees & Wagoneers as well as Jeep Comanches from 1984-1996. This glass run weatherstrip will fit both the driver & passenger front door. Save When Purchasing A Pair. This Is A New Exclusive Part Made For Team Cherokee. THE DEALER CHARGES ABOUT $140.00 EACH INDIVIDUAL SEAL. SAVE HUGE OVER THE DEALER LIST ON THIS OE SEAL. Why Pay $140.00 For One Seal When You Can Get A Pair For Less Than Half The Price Of One OE Seal. Title said it all. Hard part to find for the price and it was right. Replaced my driver side divider channel with this on my 1990 XJ. Nice snug fit and looks way better than the original that's on the passenger side. Now I'm looking to re-seal all my windows after buying this one from Team Cherokee =) Hopefully the complete Window Wipe Seal set is just as nice and same material / quality! The install is a beast though, but that's mainly because of that divider channel running all the way down to the bottom of the inside of the door. Once I got it all put together, it was the best $35 spent to reseal that part of my window. a bit expensive but in the end well worth it. I already had the interior door panels off so a small spray of silicone and slight pull on the division bar from the bottom made for a easy install. I sprayed silicone in the glass slide channel for ease of winding with the new felt. 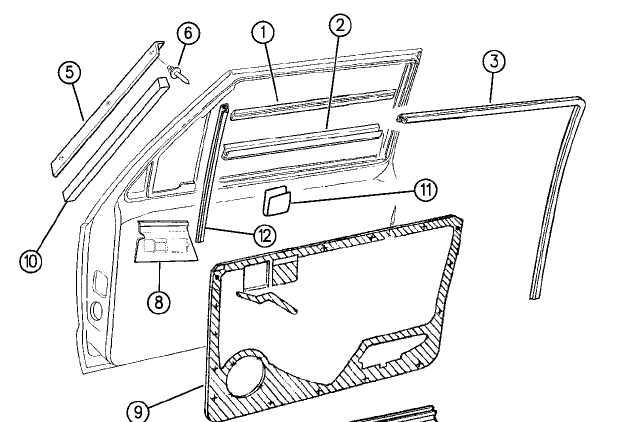 Click the button below to add the Division Bar Glass Run Weatherstrip Divider Channel Front Door Jeep Cherokee & Comanche 1984-1996 to your wish list.